[PDF] Biblical Games: Game Theory and the Hebrew Bible | Free eBooks Download - EBOOKEE! 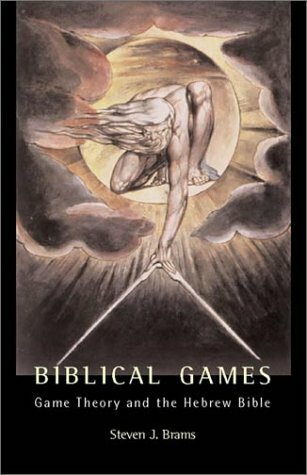 Description: In this book Steven Brams applies the mathematical theory of games to the Hebrew Bible. Brams's thesis is that God and the human biblical characters acted rationally - that is, given their preferences and their knowledge of other players' preferences, they made strategy choices that led to the best attainable outcomes. Beginning with the Creation and focusing on those stories richest in conflict and intrigue, Brams uses elementary game-theoretic tools to elucidate the rational calculations of biblical players and to show precisely the manner in which they sought to achieve their goals. He relies almost exclusively on noncooperative theory, making use of both game tree and matrix forms of games. Brams uses his strategic analysis to build a detailed assessment of God's character and motivations, including the reasons for His frequently wrathful behaviour. Brams's insights have application to biblical studies, the philosophy of religion, political theory and game theory and methodology. In the new chapter, Brams surveys the literature of the past 20 years on political-strategic interpretations of the Hebrew Bible. He also extends the game-theoretic analysis, using the theory of moves, to study a counterfactual situation - what if Abraham had refused God's command to sacrifice Isaac? - and to examine the rationality of believing in a superior being. No comments for "[PDF] Biblical Games: Game Theory and the Hebrew Bible".